The Greater Fort Lauderdale Chamber of Commerce’s Small Business Committee, is currently accepting proposals from talented speakers to present at its 2016 Small Business Committee Breakfast Forums. The Forums takes place twice a year at the Chamber. They provide opportunities for small business owners, nonprofit leaders and Chamber members to learn about key topics that will help them better manage, achieve their goals and grow their businesses. The Forums give the audience in-depth information on a topic, as well as opportunities to learn first-hand through interactive learning exercises with other business leaders. The Forums take place from 7:45 a.m. to 9:30 a.m. and the speaker presentation portion is one hour. Speakers volunteer their time and must be Chamber members. In exchange for this generous contribution, speakers receive name recognition for themselves and their businesses on the Chamber’s website; on the Forum flyer that is distributed at Chamber events and to the email database; and at the Forum itself. Note, no direct selling by speaker is permitted during the presentation. The average attendance at each Forum is 50; and examples of past Forum topics included: Time Control To Work On Your Business, Mastering The Selling Process & Uncovering Selling Opportunities, and Networking 404. The 2016 Forum dates are planned for March 29th and August 30th. Past presentations: Provide names of at least three events the speaker has presented. Include event name, topic title, and name of company hosting the event. Include host’s contact phone and email address for reference checks. Proposed topic(s) to present: marketing and sales, leadership, management and planning, finance and accounting, technology, and self-improvement may be submitted for consideration. Include topic title, outline and brief description. All proposal and questions should be referred to Doug Frens: doug@ftlchamber.com and 954-462-2570. Notice of Speaker selection status will be sent no later than COB on February 19th. Our monthly networking events are yet another way to EXPERIENCE. BETTER. BUSINESS. Pick one from one of the upcoming events or visit us at www.ftlchamber.com and Plan to SUCCEED! The best way to forge long-term business relationships is by working closely with people to accomplish goals that help the community. At the Greater Fort Lauderdale Chamber of Commerce, we are focused on helping members build their businesses and keeping our members connected. Joining a Chamber committee is a great way to make these connections. BeINvolved in issues that affect our businesses and community, learn and/or practice leadership skills, while serving with other respected business leaders. There is a Chamber committee for everyone's expertise or interest. CLICK HERE to find out more about our committees and how to get involved or visit www.ftlchamber.com/beINvolved. 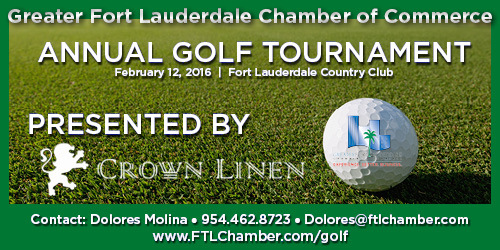 Or contact: Cristina Agnone, 954.462.4139 | Cristina@ftlchamber.com.